With one-touch scanning and no PC required, the PhotoLink personal photo scanner/converter from Pandigital makes it easy to enjoy digital copies of all your favorite printed photos. Designed for ease of use, the Pandigital Personal Photo Scanner/Converter saves scanned images directly to SD card for quick and simple transfer to your Digital Photo Frame or PC. The PhotoLink is perfect for the family genealogist, or anyone who needs to quickly and easily scan photographs or business cards. Scans standard photo sizes--perfect for the family genealogist. Just over six inches wide, for serious portability. The PhotoLink Scanner scans digital images to most memory cards with its built-in, 5-in-1 memory card reader. The scanner supports SD, MS, MS-Pro, MMC, and xD formats, and includes a free 512 MB SD card to get you started. If you'd rather scan directly to your computer, fire it up and go--with no additional software required. 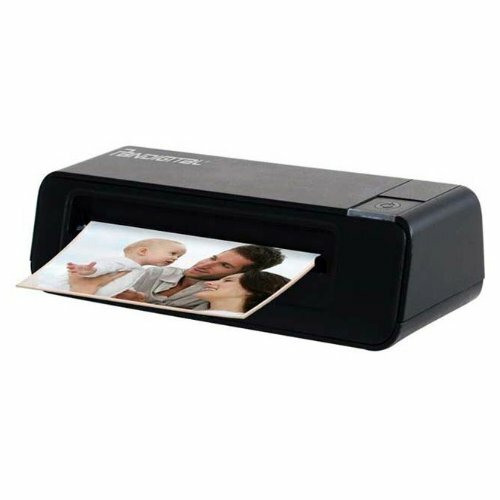 Simply connect to your computer's USB port with the included cable, insert a photo into the scanner, and press the scan button. The scanner's memory card is read by Windows and Mac machines as a storage device, and you'll have an output JPEG image waiting for you. Scanning up to 1800 x 1200 resolution (or 300 dpi) is supported. Weighing in at a mere 8 oz, and measuring just 6.15"W x 1.8"H x 1.5"D, this scanner won't tie you down to one location. Scan your pics on the coffee table while you watch TV, or anywhere else in the home. Need to help a friend digitize their photographs? Take the PhotoLink with you on your next visit--it'll fit in a backpack. When it's not in use, tuck the scanner in a drawer, and you'll have space left over. There's no need to use a straightedge, the new twin roller system ensures that the photo is fed through the scanner evenly. This prevents the photo from being scanned crooked, creating a perfect digital image every time, and protecting your original from damage. To further protect your photos, Pandigital includes two different sizes of clear plastic protection sleeves. Note that the PhotoLink is specifically designed to obtain the best scanning results with 3.5" x 5" and 4" x 6" photos, and business cards (1.5mm or thinner). Other source materials may cause the scanner to jam, or deliver unsatisfactory results.